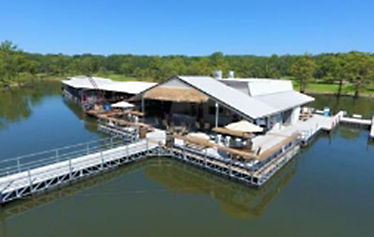 Cypress Cove Marina & Cabins welcomes you to beautiful Ft. Gibson Lake! 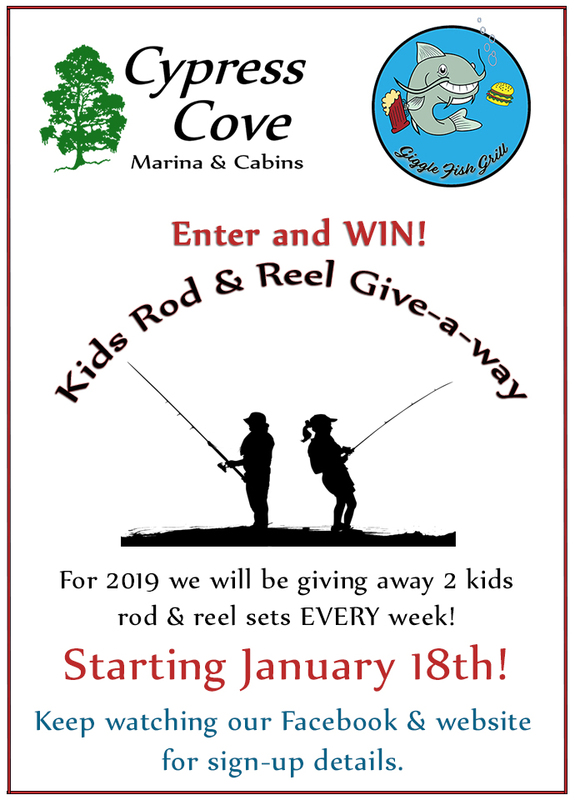 Enter the Give-A-Way for a chance to win a Kids Rod & Reel Set! 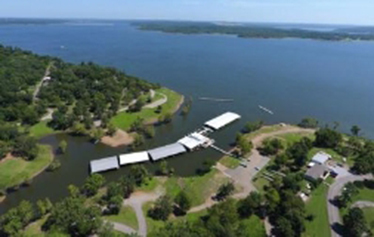 Cypress Cove Marina & Cabins welcomes you to beautiful and enchanting Fort Gibson Lake in the hills of eastern Oklahoma, where world class fishing, boating, swimming and cozy cabins make for the most memorable, affordable vacation! In the spring, timbered hills provide the sightseer with the beauty of redbud, sand plum, dogwood and haws blossoms. In the fall, colorful foliage of hickory, oak, red maple, black gum and woodbine trees set the hills aglow. Cypress Cove Marina & Cabins is open year-round for your enjoyment. 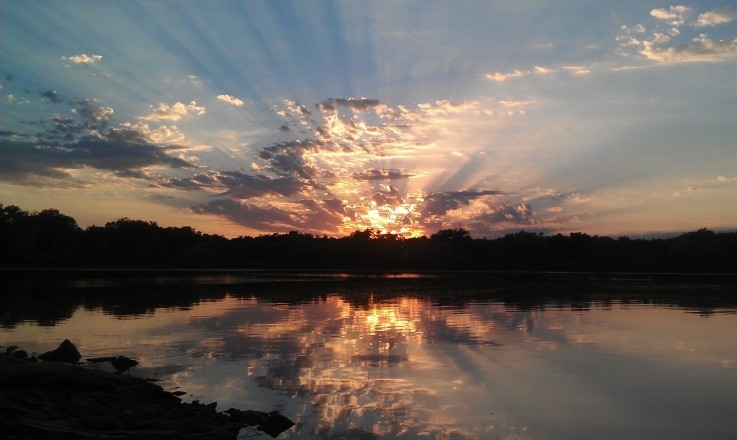 Pro and amateur fishing enthusiasts, honeymoon couples and families rave about our amenities and incredible lake sunsets. Grab your best buddies or gal pals and plan for a week or weekend at Cypress Cove Marina & Cabins. There’s so much to enjoy! 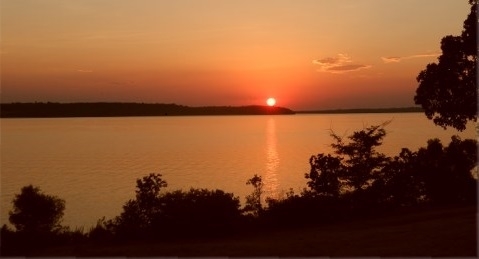 Conveniently located less than one hour from Tulsa, Cypress Cove Marina & Cabins is nestled inside Sequoyah Bay State Park on the west side of Fort Gibson Lake, just south of Wagoner and just north of Muskogee. Cypress Cove Marina is located on the west side of Ft. Gibson Lake between the Dam and the Bridge on Hwy 51. The cove is approximately 25 feet deep and leads directly out to the lake. 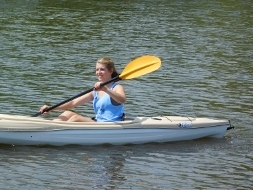 Our peaceful cove and launches make entering the lake convenient and hassle-free. If it’s less than ideal weather, use our heated fishing house to cast your line. Hike the trails or rent Cypress Cove Marina’s golf carts to explore. Want to bike? The park has lighted roads for your safety. Cypress Cove Marina & Cabins’ sandy beach is perfect for swimming in the cool, clear waters of the lake. Sunbathers and sand castles welcome! Kids can feed our “trained” fish at the marina. Bang on the rail and watch the hungry fish surface to feed and “pose” for photos. Cypress Cove Cabins are located at the back of the cove, within Sequoyah Bay State Park and just a short walk from the Marina. 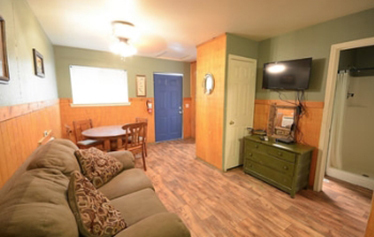 The cabins are perfect for weekend getaways, fishing trips, family reunions and great affordable vacations. The cove is approximately 25 feet deep and leads directly out to the lake. Our peaceful cove and launches make entering the lake convenient and hassle-free. Rent our 22 foot boat and party on the lake. There is just something special being out on the water in your own kayak. Rent one of ours and take to the water. A memorable lake adventure awaits at Cypress Cove Marina & Cabins! Come on over, we can’t wait to meet you!